Three charities have highlighted that child poverty and homelessness is worse than ever in Ireland. The SVP said its weekly visitations indicate that there is a lack of progress on reducing child poverty. Consistent Poverty jumped from 9.9% in 2012 to 11.7% in 2013. This means that children are going without basic day to day necessities such heating in the home, new clothes and two pairs of strong shoes. “This level of increase in child poverty coincides with the increase in the level of requests for assistance received by SVP in the same period. As a result the SVP has provided approximately €40m per year in direct assistance to families over the past five years, double the figure in the pre-austerity years,” said John-Mark McCafferty, SVP Head of Social Justice and Policy. He added that there may have been progress in improving the financial and economic well-being within some sectors in the country but it has been at the expense of people on low incomes or dependent on state payments which have been significantly reduced. 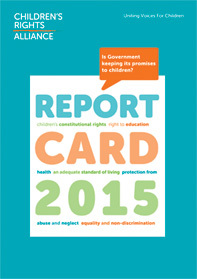 The Children’s Rights Alliance Report Card 2015 published on Monday grades the Government’s performance on issues affecting children against stated commitments in the Programme for Government 2011-2016. The Government receives an overall ‘C’ grade reflecting a satisfactory attempt, but with scope for significant improvement. 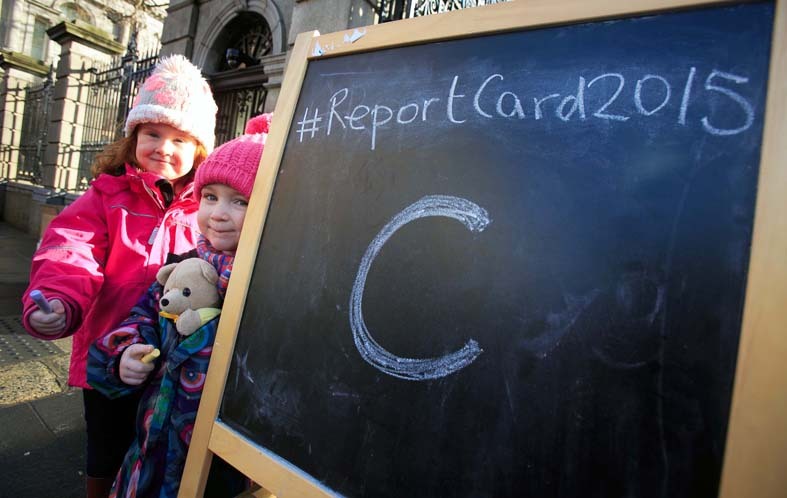 The grade has remained the same since 2013, following a peak of a ‘C+’ grade in 2012. On the child poverty aspect of the Report Card, the Government gets an F grade – a fall since last year’s grade E-. “The number of children experiencing consistent poverty has doubled since the beginning of the downturn in 2008. We can only conclude that children were, and continue to be, the real victims of the recession,” said Tanya Ward, Chief Executive of the Children’s Rights Alliance. She explained that in 2014 families continued to struggle with rising rent prices, utility bills, personal debt, homelessness and food poverty. “Although the Government introduced a small monthly increase in the Child Benefit payment for the first time in seven years, this was not enough,” she said. The Children’s Rights Alliance is calling for the Government to publish an ambitious rights-based implementation plan to achieve the Child Poverty Target and that each department carry out a social impact assessment in advance of budgetary decisions, ensuring Budget 2016 is poverty-proofed and respects children’s rights. Also this week, in a briefing document Barnardos warned that the reality of being homeless or living in unsuitable accommodation is affecting too many children. The latest Department of Environment figures revealed 865 children are living in hostels, B&Bs and hotels, the charity stated. “Unstable and inappropriate accommodation can have a devastating impact on children, not only the physical challenges, including the lack of privacy, nowhere to play or do homework, but inevitably the stress a parent is carrying will rub off on their children, causing untold emotional distress. The dual impact can be profound and long-lasting. Every effort must be made to ensure a child does not go through this,” said June Tinsley, Head of Advocacy, Barnardos. She highlighted day to day experiences such as a parent with three children and her landlord selling the property, so rather than end up in emergency accommodation she settled for a two-bed flat in a complex with rising damp and sewage issues. Other parents have been unable to secure access visits with their children because of being in emergency accommodation. Others have even had to leave their children in care because they are unable to find suitable accommodation. She said that while the Government is taking steps to tackle the lack of social housing, their response to the private rented sector issues is insufficient. Rent supplement levels are too low, as are the Housing Assistance Payments caps and there is also a continued reduction in the availability of the Rental Accommodation Scheme. Proposed action against landlords refusing rent allowance is positive but realistic rent controls and localised, family-friendly emergency accommodation is needed.